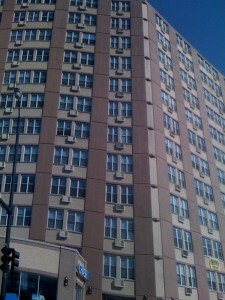 The City of Chicago Department of Buildings requires all buildings, over 7 stories in height, to undergo a critical facade inspection every 4 to 12 years. These inspections must be completed by a licensed architect or engineer. Hairline or previously repaired cracks in the parapet wall capstone joints and the interior of the parapet walls. If there is metal coping we inspect both horizontal and vertical seams for openings. Termination bar where the roof flashing is anchored to the interior of the parapet wall must be caulked. Perimeter caulking around any windows or doors leading to the roof access to see if there are cracks or holes allowing water to penetrate…in many instances on new construction, it was never done. Roof flashing and deck for open seams or punctures. Penthouse with Dri-Vit terminating at a vertical cinder block wall – check the seams. Pitched roof terminating at the gutters, we inspect the size of the gutter and downspout to make certain that it can handle the correct capacity of water runoff in a heavy rain. We also check that the flashing was installed under the roof shingles emptying into the gutter, not running behind the gutter and down the fascia board. Flat roof with a slight pitch: the parapet walls will have openings with galvanized water collection boxes for water runoff into the downspouts… we inspect the seams where they anchor to the wall for cracks or voids. Ponding of water on the roof deck. Interior roof parapet walls built of concrete block (if exposed) should be sealed with an Elastomeric Sealer or they will allow water into the walls and the top floor unit. Projections for HVAC, plumbing and electrical on roofs are checked to make sure they were properly installed – not just caulked or tarred over. A watertight rubber sleeve should have been installed under the shingles extending + 6” above the shingles or roof deck. Chimneys with a metal cap at the top have to be pitched otherwise water will pond at the top and drip into the firebox. Wall projections (pipes, vents, electrical and plumbing) are inspected for missing or improperly installed backer rod or caulk. Lintels are checked above window and door openings for the presence of flashing and drip wicks. Limestone sill joints and returns are inspected for cracking or openings. Perimeter caulking of all window and door openings are inspected for evidence of caulk failure. Vertical control joints are checked for failing caulk and if there is vertical cracking in walls over 40’ long a control joint should be installed. Gutter and downspouts are looked at to make sure they are the right size and if the roof is flat gutter cables should be present to prevent ice damming over the winter. Flashing and weep systems are checked to see if they are present above all windows, doors and at each floor level. A written report will be generated per customer’s request which will include photo documentation of suspect areas. Inspection fees vary and depend on the size of the property, time spent documenting, and any necessary rigging. Fees will be credited back to the customer if BTR performs the related recommended repairs.